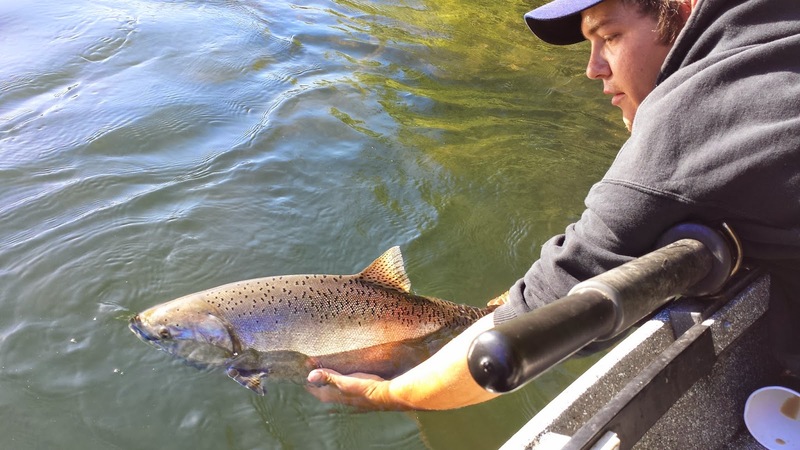 Guided Fishing on the Rogue and Umpqua Rivers' for Salmon and Steelhead in Southwest Oregon: Spring Chinook Season is in Full Swing on the Upper Rogue River in 2014 - June is a Great Month to Book Your Trip - Call Today for Open Dates! Spring Chinook Season is in Full Swing on the Upper Rogue River in 2014 - June is a Great Month to Book Your Trip - Call Today for Open Dates! A week or so after Kevin and Steven heard the last bell of the school year ring, they decided to beat the heat of Northern California's Sacramento Valley; and make a trip up North to Southern Oregon's world famous Crater Lake. A morning of salmon fishing with me; Phil, from Rogue River Sport Fishing was on their agenda as well. Steven and Kevin both had about as clear of a mind as a couple of fisherman who woke up at 4 a.m. possibly could. They were very eager to learn this technique that we had been chatting about for a month leading up to their trip. They both practiced patience, focus and curiosity when bouncing their led up and down, on and off the river bottom. Three attributes that are key for anglers when learning this tricky method. They both got it down exceptionally well and you can see the results below. When you keep your led bouncing on the river bottom all day long and you set the hook hard when you feel that bite, you have a great chance of hooking one of these salmon for yourself...or maybe two, three or four! Great job guys and I hope to see you again soon! 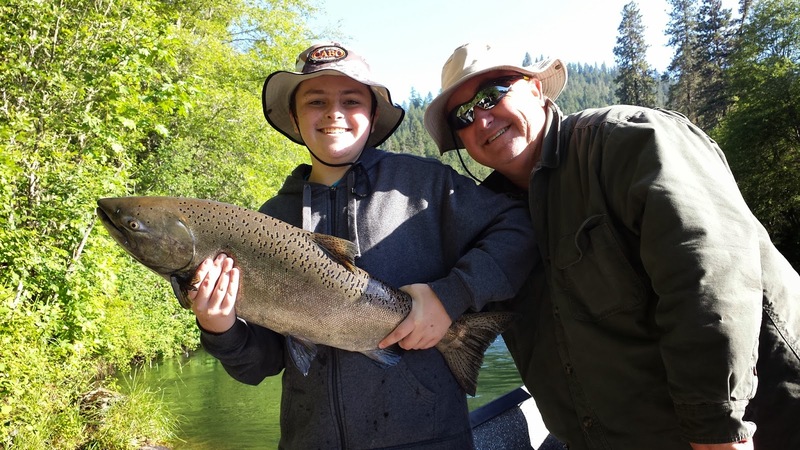 13 year old Steven and his father Kevin show off a beautiful Spring Salmon that Steven hooked Back-bouncing eggs on the upper Rogue on 6/7/14. Way to go guys! Wild Spring Chinook must be released on the upper Rogue right now! It's important when releasing your salmon to hold the fish in moderate current with their head upstream and wait until it's ready to swim away under its own power.